Hemp is the common name for cannabis, the first plant cultivated by humanity as we crept from being Neolithic to becoming Agrarian. Likely this was due to a few reasons. First, hemp is an extremely versatile plant, with leaves, seeds and stalks all capable of creating useful products. Second, it's particularly easy to grow, needing little in the way of fertilizer or pest control. And finally, hemp is native to many parts of the world, particularly The Fertile Crescent, where some of the first agriculture happened early in our civilization. Hemp has a strong historical influence on every continent, with varied cultural and religious traditions. Many African spiritual practices involve consuming hemp smoke to enhance awareness and generate visions like the Dagga "cults'. There are several varieties of hemp, most of which have very little THC [tetra-hydro-cannabanoid], the mind-effecting component. For most of U.S. history, the distinction was well-understood and laws reflected that awareness. Like so many with the power of media, however, Mr. Hearst did his best to cloud that distinction, as he was against hemp in any form. Indeed, industrial hemp was referred to as "ditchweed', while hemp for medicinal or recreations purposes has come to be known as marijuana. As reference, the timber and lumber industries, textile and petro-chemical industries are the most influential in keeping hemp illegal. As usual, we can follow the money. Then for pot there's the pharmaceutical industry, the alcohol lobby and all those anti-drug agencies with self-preservation interests. We learn much from understanding these connections. With this background, let's consider how hemp might again play a pivotal role in our culture. With hemp, we have a low-impact, high-yield crop that can be used for a variety of uses. The stalks and fiber can used for composites that can be a wood substitute in an array of products. They can also be processed to create ethanol. They can be burned as a carbon-neutral resource, since the carbon they release is but the carbon the plant ingested during it's life. Durable, light-weight, and strong, it's difficult to imagine all the uses for industrial hemp were we to focus on designing and building hemp-based products. Hemp seed can be used as a food as well. The roasted seeds are crunchy, they can be used in soups and casseroles, mixed with cereals or other foods. They're highly nutritious, have a good deal of protein and again, are positive-impact environmentally. Hemp can be grown successfully in nearly every state in these United States. One can imagine a culture where locally produced hemp provides a good portion of the energy, food and product needs for our communities. This methodology would provide employment in both production and processing of the plant. It would reduce the environmental damage caused by our overused, subsidized corn. [Corn syrup is a cheap, low grade sugar that's in a ton of processed foods.] Re-integrating hemp into our culture is just good, common sense. And then there's marijuana. The heathen devil-weed [a term coined by Heart's yellow press] was blamed for all sorts of bad behavior as part of the demonization process. But as usual, someone who smokes pot and acts badly likely acts badly anyway, with marijuana as the straw man. Marijuana reduces aggressive behavior, unlike alcohol. This slander against the singular most influential plant in human history is but one example of the dysfunctionality of our culture. It's worth noting that marijuana has not been placed as the medical cause in a single death in this country. Compare that with alcohol, tobacco, or the host of concoctions the pharmaceutical industry markets to us constantly. Mary Jane is decidedly benign. As a medicinal, hemp oil has the afore mentioned essential fatty acids that are very effective for skin issues like excema and when ingested enhances body health. Medical marijuana is much in the news these days, being legal in California and a handful of other states. It's value in alleviating the worst effect of cancer treatments, chronic back ache and other issues is well-documented. Imagine if our culture actually encouraged research on medical marijuana. Not likely when the legal drug cartel we call the pharmaceutical industry has so much influence in government. Well said, Mister Blossom. Perhaps this fall [in California Ballot Measure Prop 19] we'll begin to see a return to sanity in our policies toward this marvelous and versatile plant. And wouldn't it be just swell to see this happen in the wider context of a return to localism. Very World Five - dude. 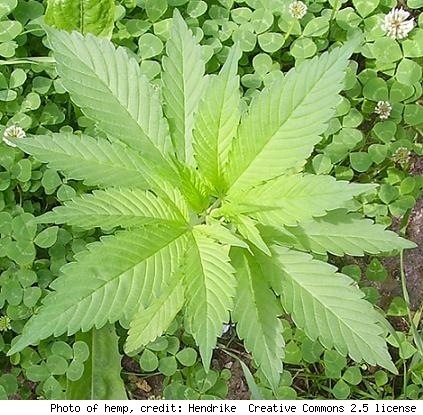 Listed below are links to blogs that reference this entry: In Praise of Hemp. I love this article. It is well written and the writer is well informed. I am so grateful to see this information out there. The United States needs to legalize Hemp for the good of the country. This page contains a single entry by Toni published on September 29, 2010 9:00 AM. US Govt Hearings Go Swimmingly for GM Salmon was the previous entry in this blog. Cancer: Italian research into antiacid based cancer therapy is the next entry in this blog.